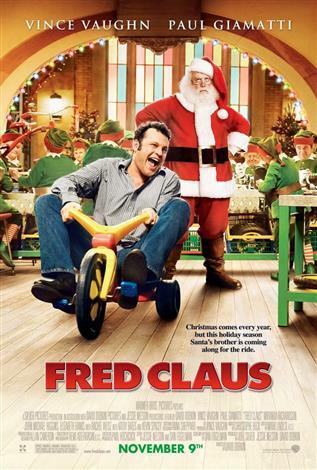 Fred Claus (VINCE VAUGHN) has lived almost his entire life in his little brother’s very large shadow. Fred tried, but he could never live up to the example set by the younger Nicholas (PAUL GIAMATTI), who was just a perfect…well…Saint. True to form, Nicholas grew up to be the model of giving, while Fred became the polar opposite: a repo man who then steals what he repossesses. Now Fred’s dirty dealings have landed him in jail. Over Mrs. Claus’s objections, Nicholas agrees to bail his big brother out on one condition: that he come to the North Pole and work off his debt making toys. The trouble is that Fred isn’t exactly elf material and, with Christmas fast approaching, this one bad seed could jeopardize the jolliest holiday of the year. Has Fred finally pushed his little brother to the brink? This time, what Fred may have stolen is Christmas itself, and it is going to take more than Rudolph to set things right.